The Hotel which actually is a rental property but has furnished units they rent on a nightly basis, was very old and in need of some updates, but our room was clean and coffee and tea were good. Towards 9:00am we make our way back on HWY 80 west to HWY 15 south. The fastest way to Page is 387 miles. Last night and early in the morning it has been raining in Salt Lake City, but as we head off the sun is shining through clouds and the sky is clearing up. Further south the clouds are getting thicker and heavier again, especially over the mountains towards east, and we drive through some light showers. On the Internet I saw a tornado warning for Page for this morning, so we are hoping that the weather system has moved on until we arrive. In Cedar City we leave HWY 15 and head east on Scenic HWY 14 towards the rain clouds. The road leads up to Midway Summit at 9,800 feet (2,900 meter) first it’s raining and the higher we get the thicker the rain becomes and eventually it’s snowing even on the road there is some wet snow, it’s winter up here. We are passing some lava fields with snow caps and colorful aspen trees, we see deers and later a bald eagle flying through the rain. It is beautiful up here, even with this weather and luckily we have seen it in sunshine as well. 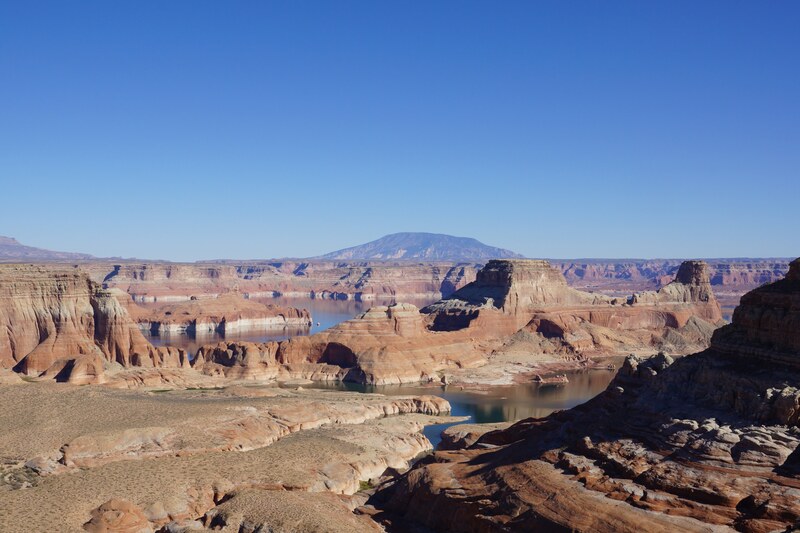 We take HWY 89 south, drive through Kanab and then east along Grand Staircase-Escalante National Monument to Page. After looking around for while we are checking in at the Motel 6. The lady at the font desk gives us the rate and then asks for credit card and driver’s license and then she says: “Oh, you are getting our senior discount” – Marco feels very old, but we gladly take it! Before going in our room we first drive back to town and have dinner: barbecued beef ribs, they are as wide as my face and taste deliciously. This gallery contains 6 pictures.